“…Dave Anderson is superb as Jimmy, a man trying to look on redundancy as a new opportunity, while Stevenson (Flo) is a tightly coiled spring of grief and resentment. This is a tightly written and well observed piece whose dialogue shows the dynamics in a long term marriage where the love seems to have got forgotten as each is locked in their own polarized world, full of crossed wires. We see a kindly man and a raging wife hopelessly locked together, not exactly on Mars and Venus, just in a kind of hell where the Scots expression ‘bombed oot’, used by Jimmy, is especially apt. Their world views are in opposition too as they argue with raw emotion over the reasons for their son’s being in Afghanistan and his terrible death. Jimmy sees ‘hope as an opiate’ and his methods of trying to move on are at odds with Flo’s coping mechanism of nursing her grief. They can’t even support the same country at Wimbledon with Jimmy idolizing Roger Federer and Flo patriotically willing Andy Murray to win. You can feel the desolation of the flickering TV screen with Jimmy lying about in his jammies as he deals with reality of the joyless despair and war zone his marriage has become. The play is poignantly punctuated by the lovely rounded tones of the saxophone and Chris Hardie appearing in combats, and playing it in a ghostly light as he appeared from behind the audience was extraordinarily moving. 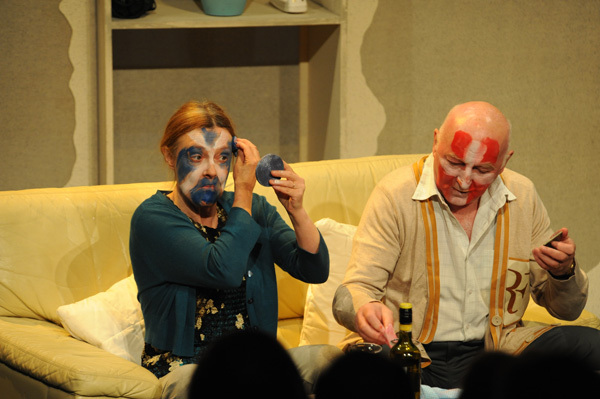 With Scottish stage veterans Gerda Stevenson and Dave Anderson being on fine form even after a long Fringe run, it is game, set and match to the team for this accomplishment. EDINBURGH. You can't walk three metres without a having a flyer pressed into your hand. Even in the gents toilet at the Assembly Theatre there's a sign saying "No flyers’. The art of seducing the public is an attraction in itself. On the High Street there are as many artists handing out leaflets as passers-by taking them. All for the sake of attracting attention: there is a pillory where you can have your photo taken, there are Romans, knights and human refrigerators, and the a capella groups bravely keep on singing through the latest pelting rain shower. Because it's always raining in Edinburgh. The performers have to throw themselves at the public, as the competition is immense. The Fringe, the big alternative festival, offers a bewildering array of 2,500 events over four weeks, with more than 40 000 performances for a million visitors in over 250 venues ranging from stuffy cellars and containers to cramped attics and college halls. The biggest slice is comedy, but there is also pop music and theatre. The regular Edinburgh Festival primarily offers classical music and opera. Then there is a renowned Book Festival and an Art Festival. The festivals do for Edinburgh what the princess does for the frog. The grey city turns soft, alive and warm. And everyone is in a hurry: seeing seven or eight shows per day is not unusual. That's possible because no show is allowed to last longer than an hour. There are scarcely any real stars at the Fringe: John Malkovich is directing a play and Ruby Wax is talking about her depression – dreary and very autobiographical. Stars are unpopular with colleagues because they take the attention away from all the artists who often invest a lot of money in this chance to make their names – and earn next to nothing. As comedian Dave Gorman wrote in The Independent: "Many comics in Edinburgh take on debts that would scare Greece."